Nuestra casa frente al mar es un auténtico Yucatán casa de vacaciones de la familia, amueblada con el confort deseado por nuestros clientes. Chuburná es único y diferente del frenesí de Cancún! 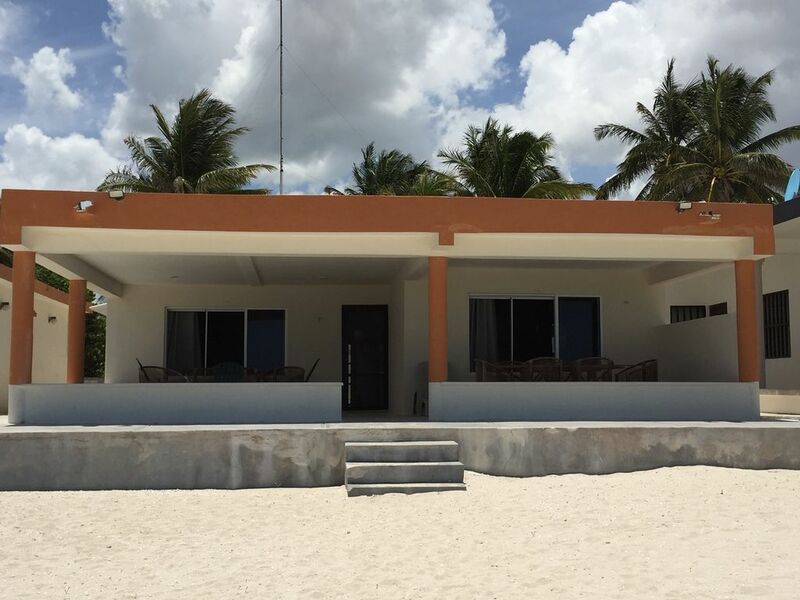 Nuestra casa de playa está situado entre las localidades de pesca respetuosos de Chuburná y Chelem, Yucatán. Se encuentra a 15 minutos del puerto de Progreso ya 35 minutos de la hermosa ciudad colonial de Mérida. El aeropuerto se encuentra en Mérida y el código es MID. Nuestra casa de playa está totalmente amueblado y diseñado para la relajación completa, durante una semana o durante meses a la vez, pero accesible al gran puerto de Progreso y la principal ciudad de Mérida para todas sus necesidades. Esta casa está situada en una zona tranquila con vecinos estadounidenses, canadienses y británicos que viven allí meses a la vez. Algunos vecinos son huéspedes de invierno otros ahora llaman hogar. Estamos a 5 minutos en coche de la ciudad de Chuburná, donde usted encontrará los lugareños que algunas de las personas más agradables y amistosos. Nuestra familia ha disfrutado de esta casa durante los últimos 20 años como una casa de vacaciones con nuestros 4 hijos y esperamos con ganas de relajarse allí durante meses en un momento cuando nos retiremos, y algún día con nuestros nietos también. Esta casa de playa es perfecto para desconectarse y salir en un ambiente muy relajado, pero con suficientes actividades cercanas. Esperamos contar con usted como nuestro invitado y compartir la experiencia de esta gran casa frente al mar en la hermosa Yucatán en un entorno único y tranquilo y amigable con todos ustedes! Ideal para 2 familias de vacaciones juntos y sin embargo ser en casas separadas !!! Hamacas incluidos - perfecto para la siesta en el porche o para dormir bajo techo, horno tostador, cafetera, t. v., situado en una zona tranquila con vecinos estadounidenses, canadienses y británicos, totalmente amueblado con muebles muy cómodos y varios comer en interiores y al aire libre y áreas, los servicios de limpieza de relax (disponibles por una tarifa, si se solicita con antelación), Portero tiene teléfono celular y vive 2 casas más abajo, amigable para los niños - nuestra familia de 6 con 4 niños ha pasado todo el mes de julio por aproximadamente 20 años, y ahora tenemos también totalmente amueblado a pasar muchos meses en un momento en que nos retiramos, o para pasar los veranos con nuestros nietos, perfecto para una estancia corta o larga en un ambiente tranquilo. The house was wonderfully equipped for our long-term stay (Linens, cookware, china, even paper products). The house is spacious and has plenty of comfortable furniture both inside and out on the huge, covered patio. The CD and DVD players that were advertised did not work, nor did the TV in the second bedroom. However, The large flat-screen TV (satellite) in the living room had both USB and HDMI ports to accommodate most any electronics you bring with you. The beach is beautiful, and for most days through the winter, practically deserted. Sun tanning in the loungers can be either on the beach or on the front deck. The house is 1 1/2 km from the village of Chuburna where we would walk to buy supplies or to stop at a restaurant for a drink and wonderfully generous "botanos" (Mexican version of tapas). It is cheap and easy to move around using the small vans (combis). We made at least one trip to Progreso each week for more extensive shopping, and one trip each week to Merida for its culture, sightseeing, or to take a tour to the many nearby, spectacular Mayan archeological sites. We also did 3-day side trips to the nearby cities of Valladolid and Campeche. Everywhere we went, everyone we met was unfailingly friendly, courteous and helpful. People back home could take a lesson from these wonderful people. This was a terrific choice for a long-term stay. It was quiet and peaceful and we got to feel like we were part of a community. Yet, we were only a few short kilometers from any social or cultural activities we might desire. If you are looking for a high-energy vacation surrounded by tourists like yourself, go to Cancun. If you want a beautiful and relaxed setting that is much closer to the "real" Mexico then this is the place for you. Thank you very much for your wonderful review on our beachfront home in the Yucatan! I sincerely appreciate you sharing your experience of the hospitable people of the Yucatan and your appreciation for the Mayan culture. So glad y'all enjoyed it all and I am thankful for having the opportunity to share our small piece of paradise with such nice people. Thanks again and best wishes on your future journeys! It was a pleasure meeting you both. Our Home Away from Home!! This beach house was great for our one month vacation by the ocean. It had all the amenities that we required. The WiFi was a great asset for us to keep in touch with our family and friends. When we arrived the house was clean and inviting with a few supplies and a large jug of water. The ocean view from the veranda was spectacular and there were chairs and a nice eating area for us to have a early morning coffee or siesta. Carlos the caretaker - a phone call away was fantastic - and very helpful in ensuring that we were comfortable. Any repairs, maintainance or removing our weekly garbage was done immediately!! The owner of this home was the most wonderful person, not only very accommodating and very helpful in any questions we had... and believe me...I had many to answer!!! The new microwave, toaster and gas BBQ were delivered within days of contacting the owner by email. The description and photos of the house was accurate, and 3 days after arriving we contacted the owner to book 2 months next year, that's how much we loved it!! We took a cambio into Progreso for 20 peso each, which drooped us in the centre of town, where we shopped at local markets and two large grocery stores - San Francisco and the Bodega, which is similar to Costco. The cab ride back cost us 115 pesos - door to door! We found no need for a car, because the local cambio and cab service is very efficient and really reasonable! The local folks are wonderful people, even with OUR lack of Spanish they helped us out in the market, on the streets and even taking the rides to and from town...very kind, patient, friendly, loving people. We enjoyed our time here...and will be back for more sun, sand, ocean & cocktails next year!! Thank you very much for your kind words regarding our beach home, our property caretaker, and most importantly for sharing your pleasant experience in the beautiful Yucatan and its hospitable people! We are blessed to be able to share our small piece of paradise with you all and look forward to having you all as our guests next year. Thank you very much for your kind words regarding your time in our vacation home. I am glad you all enjoyed it and we hope to have you all back next year as planned. I do apologize for not having the BBQ grill. I honestly was not aware that it had fallen apart. The guests that arrived after you, advised us of the need of a BBQ grill and we replaced it with a very nice new grill, and the new guests seemed to enjoy it. I am very glad that Carlos, our property caretaker, was his usual dependable helpful host. Thanks again and we are very glad that we were able to share our small piece of paradise with you and that you will be coming back to continue the experience of the beautiful Yucatan and its hospitable people! Muchas gracias! We really enjoyed living on the beach in Chuburna. The beach in front of the home is one of the best in the area. Great for morning walks and shell searching. We were very fortunate to have found this home for our first trip to the Yucatan. Close to Progreso and Merida for anything you may need. Lots of sights to see or just relaxing in a hammock on the porch. Particularly enjoyed the pelicans diving for fish right in front of the house. Dolphins swim by in the late afternoon and were very lucky to witness sea turtles hatching under the greenery next door! Loved visiting the pueblos close by, Chuburna and Chelem, for fruits and vegetables. The local people are some of the friendliest and helpful people you will ever meet. We definitely recommend this home for your vacation and we are sure you will fall in love with the area as much as we did. Thanks to the owners for being such wonderful hosts and also thanks to Carlos, the caretaker, for always being just a phone call away. I stayed on this beachhouse in June for about 2 weeks and it was fantastic! I'd go back in a heartbeat! The ocean was breathtakingly beautiful. So calm and serene. The weather was great for swimming and just laying out on the beach. We went barefoot into the beach all the time and the shoreline was very safe. Not too many rocks or seaweed. You are able to go really far out into the ocean with minimal waves and still being able to stand! Many chairs are provided for laying out as well. The hammocks provided in the beach house made the experience more authentic. We tried not only laying out in them but sleeping in them too... (Not recommended for those unexperienced with hammocks! haha) But the beds were comfortable. There is no AC in the beach house and it does get pretty hot during the day (nothing a quick dip in the ocean can't fix), but at night it cools down alot and makes sleeping comfortable. The beachhouse had every appliance and convience we needed. There was a coffee maker (a necessity), blender, and purified water. Everything was well maintained and clean. The location is excellent. We felt very safe in the neighborhood it is in. It is close to a few small towns with some great restaurants (Costa Azul in Chuburna had some great seafood and ceviche!). Progresso is a quick 10 minute drive and the supermarket is located there, along with some beachfront shopping and dining. Overall, a fantastic location for a vacation!! I went on a trip with friends, but I feel like this beachhouse could cater to all types of vacations. The house is large enough to accomadate large families, with plenty of space for both sleeping and dining. The beach really can't be beat. We went to Cancun during this trip as well, and while the beach there was extremely blue and pretty, you couldn't even get in because the waves are so high. The beautiful white sand and clear water make this beach and beachhouse absolute paradise!! I went with my best girlfriends for a few weeks and had a wonderful time! The pictures posted on this website did the house no justice- the view from the front porch is breathtaking. The house is well kept and the owners/care takers are there for anything. We didn't have any problems and loved every minute. The house is located just far enough away that we had peace and tranquility on the beach but close enough for us to go into the city to dance the night away! Also, there are a surprising amount of places to go: natural caves, haciendas, ruins, etc. You will not run out of places to see! The kitchen is well equipped for cooking at home but there are towns close by with delicious fresh seafood and authentic mexican tacos. I highly recommend this place and will definitely be returning! *We offer special rates for LONG terms guests and for RETURN guests. *BETTER PRICES offered to guests who stay for several months at a time. *Pet fee pricing will be according to length of stay. *Property caretaker fee will also be according to length of stay. *Additional guest fee for more than 4 people apply. It will be $10 a person per night after 4th guest. *QUESTIONS? PLEASE CONTACT OWNER, GRACIAS!